Until recently, my work has been on a minature scale. Tiny birds, animals, and fantasy figures, fashioned into earrings, pendants, or figurines, made up the majority of my pieces, nearly always sculpted in the round. A few weeks ago, a friend of mine suggested that I make some brooches, which I hadn't tried in years, and then only a few pieces, which were stamped into the polymer clay, rather than sculpted. In my previous post, Metallic Ravens, I wrote about the first pieces that I sculpted in bas-relief rather than in the round. Excited about my new technique, which was larger and bolder than my previous work, I decided to try a red fox in a similar Inuit-inspired style. To my surprise, this was not successful. After numerous attempts, nothing came together. 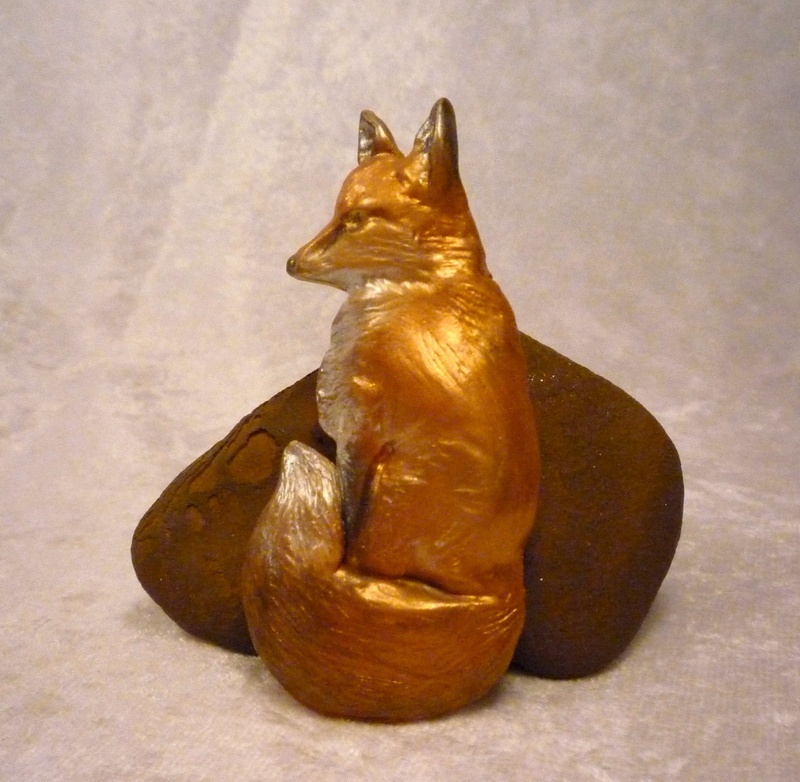 The fox seemed to demand a more naturalistic approach, so I worked with that idea in mind, and persisted until I was pleased with the result. I think this fox pin is charming. The same thing happened with my next brooch, an owl. Again I started working with inspiration from Inuit art prints, but again it wouldn't come together. The owl also needed a more realistic look. 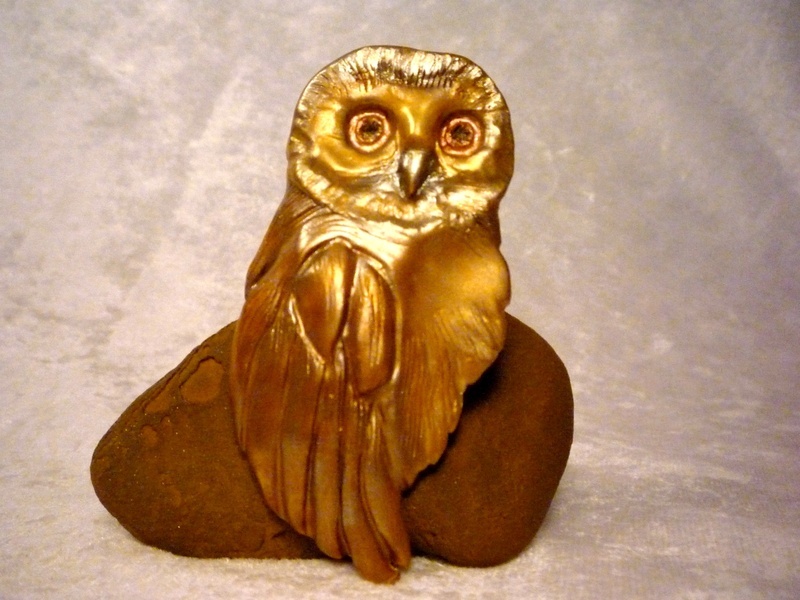 In the end, this owl brooch is more stylized than the fox, but much more realistic than the ravens. I almost despaired of him a few times, but he came together in the end, and I really like the resulting brooch. 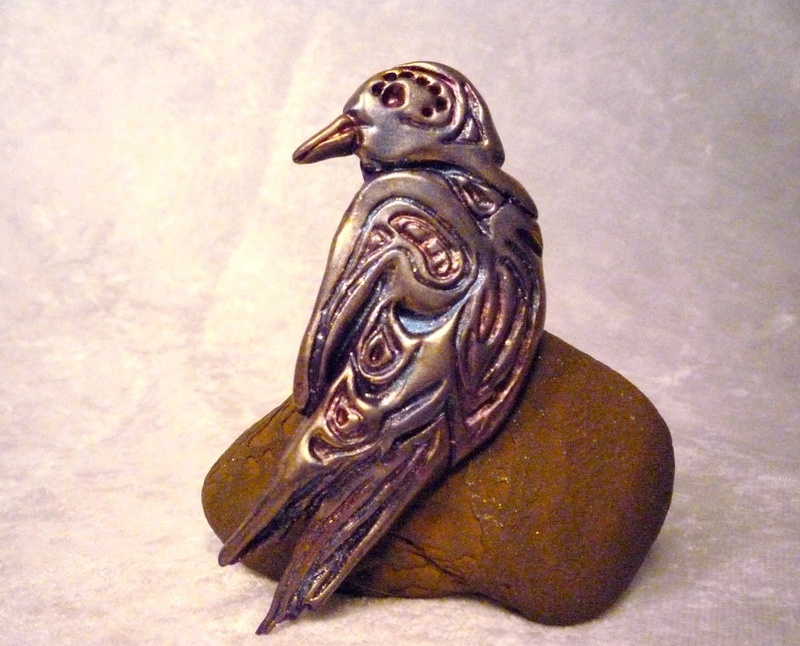 I finished three brooches during this period, and the last, a bird, reverts back to the metallic-looking, somewhat abstract, Inuit print style. He is the most stylized, the most abstract; so much so that his breed isn't clear, except that his position hints at a woodpecker. This bird is the most like the ravens I made earlier.